More than a game, for some sports is family. In most athletic situations at school, families can participate as spectators, watching their sibling or child compete from the sidelines. 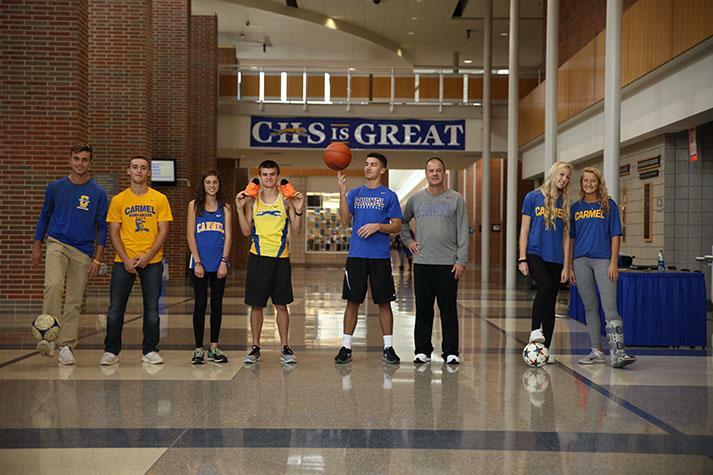 However, for a few at CHS, being involved in sports is their opportunity to compete and grow with their family members on the same court or field. For these family members, sports gives them a common activity and related interest to talk to one another about and bond over. 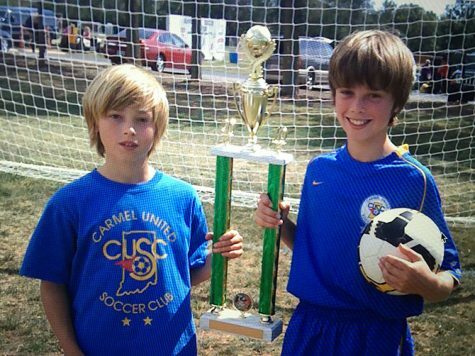 Defender and senior Harrison Adams, along with his younger brother, defender and junior Cameron “Cam” Adams, both play on the men’s soccer team together on the backline. “It’s just cool because it’s something that will never happen again. We just get to do all this stuff together and go to practice together and train. It’s just an awesome experience,” Harrison said. According to Cam, the emotional support between the two is just as important as the physical aspect of playing on the same team. “I like being able to know that I can count on Harrison being there in case I make a mistake. It’s just good to know that I’m supported,” Cam said. Support can come in different forms other than making up for mistakes. 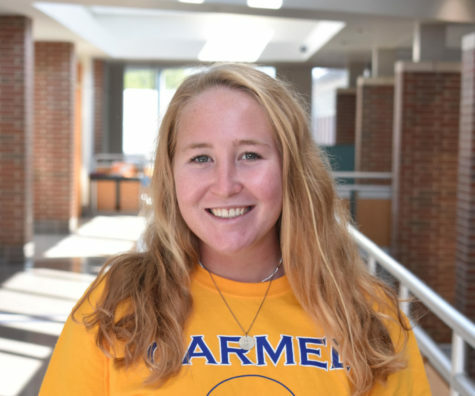 For Ali James, soccer player and senior, she can sometimes be critical of her younger sister Kelsie James, varsity soccer player and freshman, something that cannot always be done with other teammates. For Kelsie, being able to work well with her sister is something she’s come to love and appreciate. 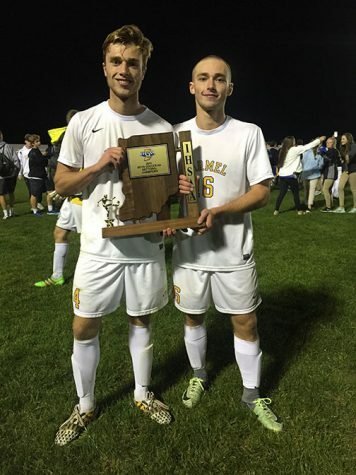 Senior Harrison Adams (left) and his brother, junior Cameron Adams (right), hold up the Sectional championship trophy after defeating Guerin Catholic High School. 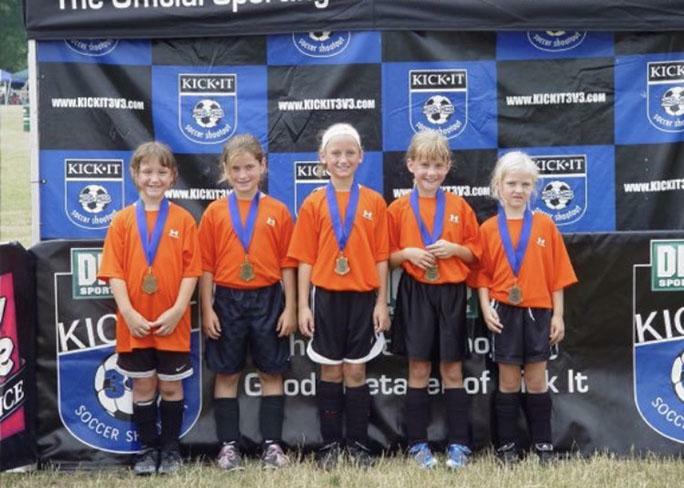 “Ali helps me blend with the team, and it’s nice to know someone really well,” Kelsie said. Most athletes can agree that team chemistry is crucial to winning; Harrison and Cam both said they have good chemistry on the field with each other and with their teammates. 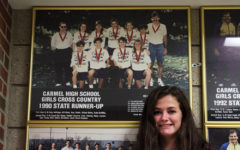 In an individualized sport such as cross-country, it can be difficult to relate to a team setting during competition time. Runner and sophomore, Calvin Bates, and his sister, runner and freshman Phoebe Bates, said they find ways to bond by talking about each other’s sport lives. “It’s fun because you both have something you can talk about. Sometimes a lot of siblings don’t have that. To be able to relate to that is cool,” Calvin said. Phoebe said she agrees that playing, or in this case running, the same sport has brought the two closer together by giving them something in common to discuss. “Before we did cross-country, we never had anything to talk about at the dinner table, so instead of just sitting on our phones, we can actually bond now,” Phoebe said. 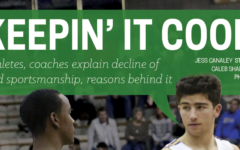 Scott Heady, men’s basketball Head Coach, and his son, point guard and sophomore, Luke Heady, share a different type of relationship in sports, one even more uncommon than in siblings: as coach of the basketball team and father to one of the players. Heady said he stresses making sure that everyone has the same opportunities on the team while also being a supportive parental figure to his son. 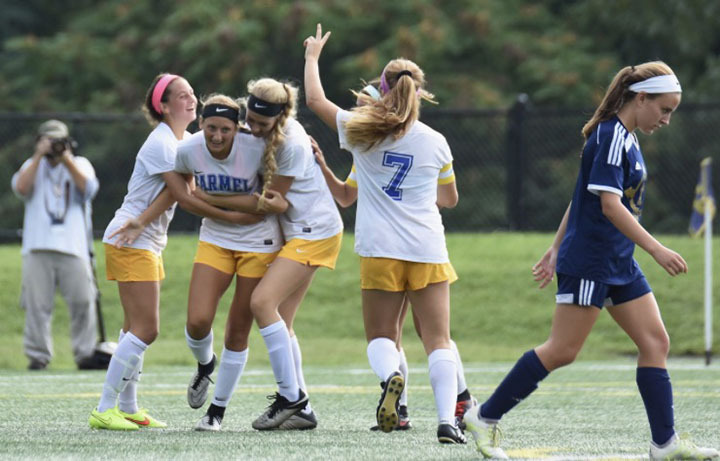 Freshman Kelsie James hugs her sister, senior Ali James, after Ali scored in a game against Cathedral High School, as their cousin, senior Emily Roberts (7) comes to celebrate. 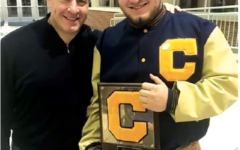 Being the coach’s son isn’t always easy for Luke, but he said he knows what his dad expects of him and what he has to do to prove he belongs on the team.